Dan Watson has been making hurdles for 30 years and reckons there are over 200 hurdle-makers in the UK. The process is physically demanding but also very skillful. 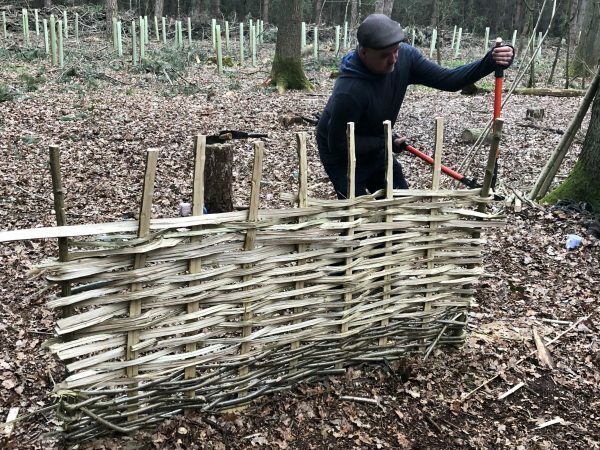 Dan now uses his own small woodland and in a single day he can make three hurdles - by contrast it took me a whole day and lots of help to get mine half finished - hurdle-making gets much quicker, and neater, with experience. There are several skilled operations in creating a hurdle. 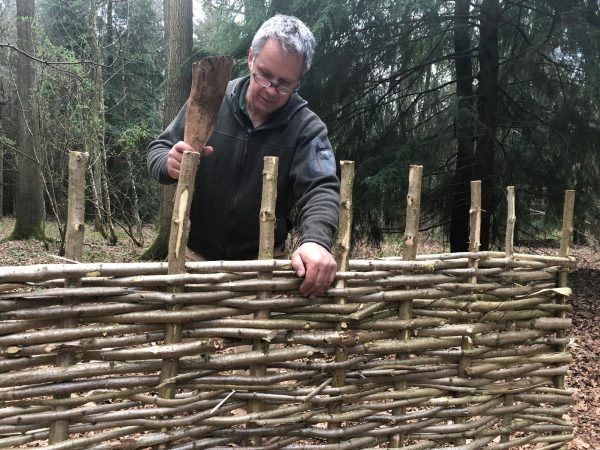 You start by selecting the hazel rods from hazel coppice and cut them at the base. Next, you take these branches to your working area and trim off the side twigs being careful to cut upwards to avoid creating tears in the bark. A base plate is needed with holes and ours had nine so that none uprights could be put into the base making a hurdle six feet wide and eventually about 4 foot high. The first few layers of hazel spars are usually thin ones which are not split woven between the uprights. After that you use hazel rods that you split and doing that splitting is quite an art. Split wood is stronger than sawn wood. 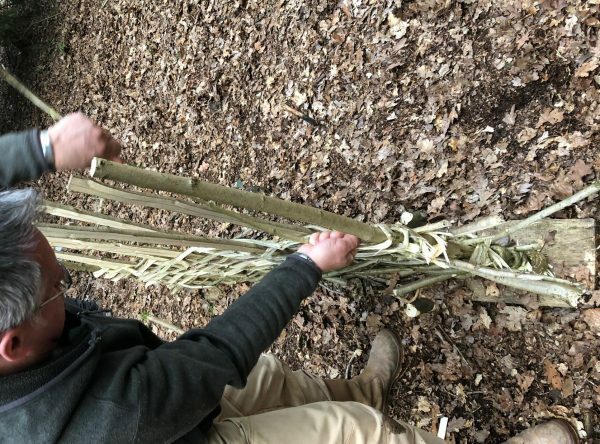 Using a billhook you split the hazel rods along their whole length using the blade as a lever, wiggling it from side to side as it goes down the pole. These split rods are easier to bend around the ends and keep the screen from getting too heavy. I found the most difficult task in making my hurdle was bending the rods around the last upright at each end. This bending requires lots of wrist strength and many hurdle makers suffer from wrist sprains and repetitive strain arm injuries. The action needed is a combination of bending and twisting because you need to get the rod twisted more than 180 degrees without breaking. If the ends are bent neatly the finished hurdle truly looks like a work of art. Apart from billhooks there are other tools needed in hurdle-making. To push down the thicker rods you need a mawl, a club-like mallet, and you will also need something to cut off the ends of some of the hazel rods. Some people use their billhook whist others use sharp loppers. 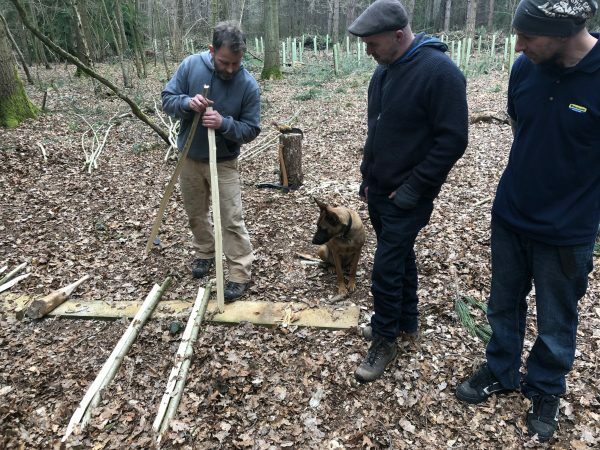 Experienced hurdle makers will be very aware of what sort of billhook they are using and may use a different billhooks for the various tasks. 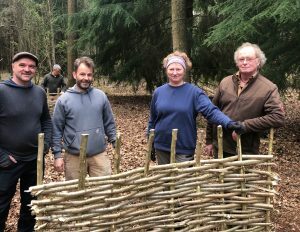 The star performer in making a hurdle is really the hazel itself - no other wood grows as straight and even with fibres that are so splittable and bendable. A fully formed hurdle makes a useful screen which can be used as a windbreak or creates an attractive visual barrier. Traditionally hurdles like this were used for fencing or heave gates (temporary gates that have to be lifted into and out of position). 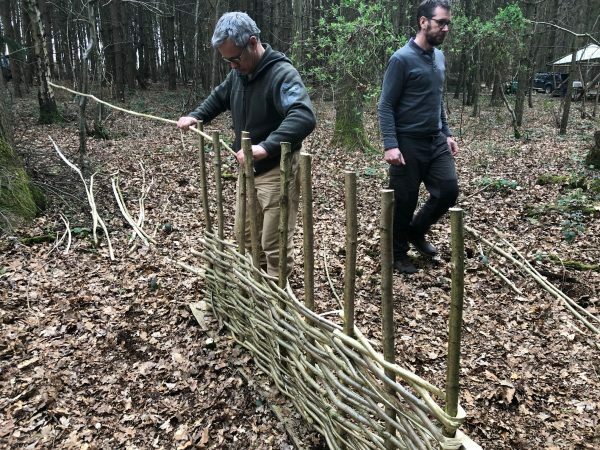 Hurdle-making courses are great fun and most woodlands have some useable hazel coppice.